well, i'm back and it looks like my funky guessing game didn't go over so well huh? i guess no one wants to do any "work" and just fly in and grab the tunes and run... oh well. i won't do that AGAIN! 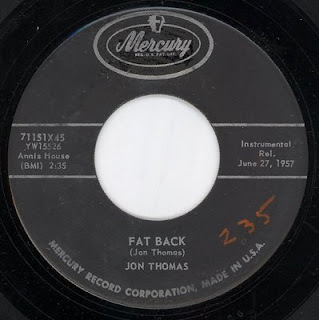 Jon Thomas – “Fat Back”: A nice slow burning soulful Las Vegas Grind instrumental R&B number type number with plenty of Killer organ and sax from 1957. I posted this over at Planet Mondo Atomic Blog a while back but thought this needed its own treatment. The Devil will be out of town for the next week or so jamming with my band over in Holland at the Roadburn Festival so I am giving you something to hold you over for a while! So while I'm overseas playing Heavy Metal riffs i leave you with something FUNKY! I'm also going try something different here to see if anyone is paying attention. You don't get the track list until I get back! How many of these tracks can you name! 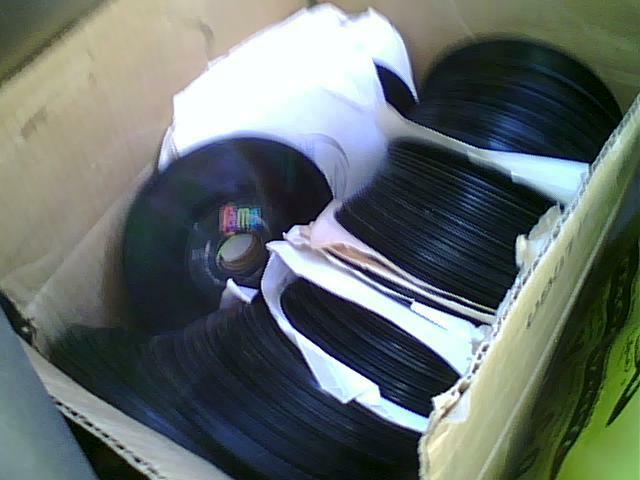 The only hint you get is that these are all OG album cuts here, no 45's! Other than that a search says this is uncomped... if that matters to you? If you have any info please drop it. 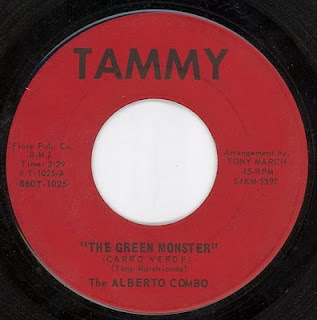 I'll be honest i only bought this off the strength of the amazing Iron Knowledge 45 which is also on the Tammy label and was the very 1st music posted on this lil blog and knew nothing about this 45 but the label coupled with the title "Green Monster" were enough for me to shell out a few clams and take a chance. And I'm happy i did because this is a pretty cool little record. Any record that starts off with engines reving and then steals some Bo Diddly with some cool horns and nifty guitar work is A-OK in my book! Dig In! Atomic Rooster were an English progressive rock band, formed by ex-Crazy World of Arthur Brown members, Vincent Crane and Carl Palmer in late 1969. In January, 1970 Atomic Rooster (at that time consisting of Crane, Palmer and Nick Graham) released their self-titled debut album. Between Palmer's departure (to be one third of Emerson, Lake & Palmer), and the recording of a second album, guitarist John Du Cann (Andromeda) joined them, giving a whole new dimension to the music with his distinctive guitar attack. Having found success on the UK Singles Chart, the band was augmented with singer Peter French (ex-Leaf Hound) for their third effort on vinyl, In Hearing Of Atomic Rooster. It showed the band at full throttle. 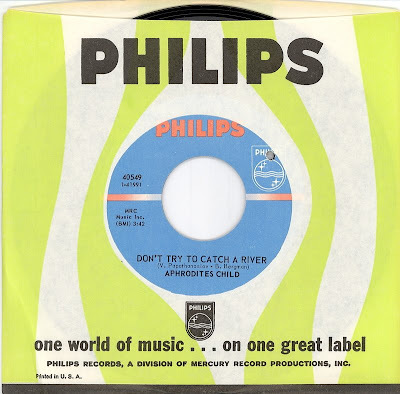 The import version included the hit single "The Devil's Answer", although this was strangely missing from the original UK release. After this album, Cann, Hammond and French left the band. French went to join Cactus, while John Du Cann and Paul Hammond teamed up with ex-Quatermass bass player John Gustafson and founded Hard Stuff. Crane put the band together one more time, recruiting 1960s British R&B singer and ex-Colosseum vocalist Chris Farlowe. Along with old friends John Goodsall, then known as "Johnny Mandala", and Rick Parnell (who is the son of orchestra leader Jack Parnell, and composed material on the last album, plus came up with the piano riff on "Tomorrow Night") they released Made In England. They managed to release one more album, Nice 'n' Greasy, but the sound was somewhat diluted, although the tracks "Voodoo In You" and "Take One Toke" reminded their fans of past glories. It proved to be their last record in the 1970s. Here just a big dumb pile of rocks strung together by a guy with rocks in his head and a stone heart and just something to start your weekend out a little rocky... (lame i know, whatever....) The Devil's 7th mix, enjoy some big dumb rock! Turn it up and get rockin'!!! REO Speedwagon – Ridin’ the Storm Out: Odd choice you say? Not so much. Leslie West – Blood of the Sun: From his solo album oddly enough titled “Mountain”. This has one of THEE coolest and heaviest riffs ever produced short of Iommi himself. Power of Zeus – It Couldn’t Be Me: Way sought after 70’s rocker with some killer moves and vibes. This song simply jams! Nektar – Fidgity Queen: German prog freaks getting funky! Groundhogs – The Grey Maze: I have a soft spot for these English blues hounds and their twisted mix blues & hard rock! Savage Grace – She’s a Woman: Nice tight Detroit rocker with a somewhat funky edge but still staying pretty hard and heavy. Personally I think these guys are way under-rated. Tucky Buzzard – Stainless Steel Lady: British Hard rock band formed in 1969 by three former members of The End. Also notable; Bill Wyman of the Rolling Stones produced them. Cool loose vibe on this cut and once again under-rated band IMHO. I used to date a gothy punk girl in the 80's and she definitely widened my punk and metal muisc pallet to a lot of different stuff and i remember her digging this tune a great deal. DJ Jack the Ripper what is your excuse? And do you have this "Long Version" or only the single? 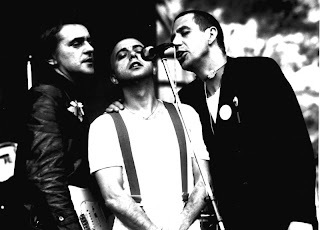 Trio was formed in the small German town of Großenkneten in 1979. By far, the band is most noted for the song "Da da da, ich lieb dich nicht du liebst mich nicht aha aha aha" (or simply "Da Da Da"), or its English version "Da Da Da I Don't Love You You Don't Love Me Aha Aha Aha", which was a hit in about 30 countries worldwide. The song is often given as an example of a song that has become popular while being extremely repetitive. However, to understand Trio one must understand its context. It was a product of the Neue Deutsche Welle (or NDW). However, Trio preferred the name Neue Deutsche Fröhlichkeit, which means "New German Cheerfulness", to describe their music. At that time, as now, popular songs were based on extremely simple structures that were ornately produced. 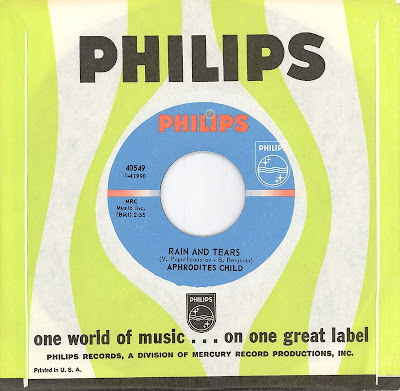 Trio's main principle was to remove almost all the ornamentation and polish from their songs, and to use the simplest practical structures (most of their songs were three-chord songs). For this reason, many of their songs are restricted to drums, guitar, vocals, and just one or maybe two other instruments, if any at all. Bass was used very infrequently until their later songs, and live shows often saw Remmler playing some simple preprogrammed rhythms and melodies on his small Casio VL-1 keyboard while Behrens played his drums single-handedly while eating an apple. This simplicity was not simply due to an inability to sing or play well; Remmler's later solo career shows that he was capable of much more complicated music, and Kralle has demonstrated considerable ability as a guitarist in other ventures. Rather, their songs were bare-boned to show how bare the bones actually are. they were much more a child of the 60’s and in a lighter psych vein. And while it pours buckets of rain on the East Coast today I thought it fitting to post these 2 numbers that I have had on deck for a good long while now. So with no more useless chatter from me, enjoy.